I want you to think about the following statement: 97% of scientists agree that climate change is man-made and dangerous. It’s a factual claim, but in today’s political climate it is emotionally charged. If you believe climate change you might find the statement compelling. If you are a skeptic of global warming, you probably think this statement is false, and even if it were true that’s not how science is done. Here’s the deal: This statement isn’t true, and it isn’t a good scientific argument. Last time I talked about framing and emotional appeals. How a writer can use emotion to make you more open to agreeing with them. For example, you may have noticed the framing of my first paragraph. Here’s a statement that’s often used against climate skeptics, but I agree with the skeptics. See how honest I am? You can surely trust me, I’m on your side. Of course in my last post I noted that I believe in global warming, so I probably just framed it that way to trick you. The 97% statement is important not only because of its popularity among climate change believers, but also because debunking it is a central focus of the NIPCC report. As the report states in chapter 1 (near top of page 8) “This popular narrative grossly oversimplifies the issue while libeling scientists who question the alleged consensus.” Again notice the great emotional hook. Climate science is incompetent at best, if not outright lying. Now, this may be true, but the statement primes us to be skeptical of climate studies. If the environmental types can’t be trusted about a simple survey, they surely can’t be trusted about real science. If we agree with the writer, we are predisposed to be skeptical of other climate claims. It is extremely likely (95%+ certainty) that more than half of the observed increase in global average surface temperature from 1951 to 2010 was cause by the anthropogenic increase in greenhouse gas concentrations and other anthropogenic forcings together. Do you notice the difference? They both have the 97-ish% statistic, so at first glance it looks like the top quote is just a wordy version of the second. But read them again. They are actually two different claims. 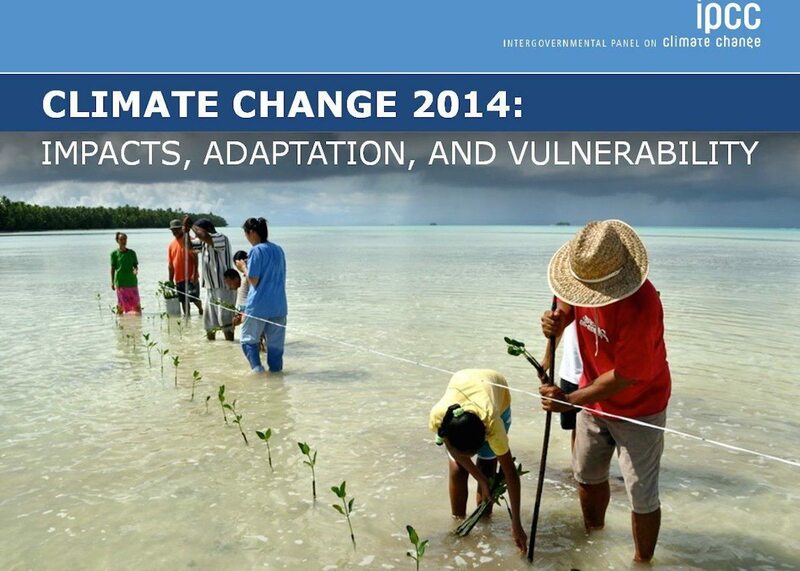 The first is a summary statement from the IPCC report about climate data and the resulting models. The 95%+ certainty is a statistical measure of how consistent the data is. This is standard science. We take data, compare them to models and predictions, and statistically estimate the strength of the data. The second statement is a summary of scientific opinions. How many scientists hold a particular view. Here’s a similar example. Suppose I have a room full of 100 pets. I’ve never seen the room, but I pay 1,000 people to go into the room and count how many dogs there are. Some count 25, some 30, and so on. There could be lots of reasons the numbers don’t agree. Maybe there’s some cats in the room that look like dogs. Maybe there’s a raccoon, and some people count it as a dog. It doesn’t really matter. They come back and give me their data, and I crunch the numbers. What I find is that to a 95% certainty there are 28 dogs. There might be 25 or 30. There might be only 4, but that isn’t very likely. This is similar to the first statement. Now suppose I do a survey of people on the street. If they are a pet owner, I ask them if they think there are about 28 dogs in the room. I tally their responses, and find that 97% say yes, there are probably about 28 dogs in the room. This is similar to the second statement. One is a summary of scientific opinion, while the other is a summary of scientific data. But the report puts both statements in the same pile, implying that if one is false, so is the other. This is known as conflating the issues. You see this a lot in online debates. As I write this post a massive iceberg has recently broken off Antarctica. Lots of posts on the interwebs are linking to the story to say “See? Global warming is real!” But that conflates two very different claims. Even if the iceberg formed due to local warming, that doesn’t necessarily mean that the world is warming as a whole. This conflation of claims here is really interesting. Members of the NIPCC are skilled scientists. They understand the difference between climate research and opinion research. They wouldn’t confuse the two by mistake. That means this was intentional. They intended to link these two claims. You might think I’m now going to call them liars, or say they are intentionally misleading readers. I’m not. As I stated in the first post, my assumption is that the NIPCC is both qualified and honest in their approach. I point it out because further into the book they are going to use this connection to make a much stronger accusation. We will want to see how they get there. But for now let’s look at that 97% consensus claim. The report summarizes more than a dozen published works, but I’m only going to focus on a few of them. Just to keep me honest, I recommend you read through the whole summary yourself, though the conclusion of the report is similar for all of them. We’ll start with a 2008 paper by Klaus-Martin Schulte. This work is a response to a 2004 paper by Naomi Oreskes. In the original paper, Oreskes searched peer-reviewed scientific papers for the keywords “global climate change.” She found 928 papers, and then used their abstracts to determine whether the work supported the “consensus view” of climate change. That is, global warming is real and it’s caused largely by human activity. She found that 75% seemed to endorse climate change, while the remaining 25% were neutral. None opposed the consensus view. That seems pretty compelling, but when Schulte did a follow up survey following similar methods, he found 539 new papers. Of those, only 45% supported the consensus view, either directly or indirectly, while 6% opposed the consensus view. This would seem to indicate a growing opposition to global warming among scientists. The report argues that Schulte’s work is a clear debunking of Oreskes’. Specifically, the drop of support for climate change from 75% to 45%. But this conclusion isn’t as strong as they claim. Both works rely on researchers making some kind of statement on global warming one way or the other. So there is a drop from 75% to 45%, but we don’t know why. It could be because fewer researchers support the consensus view, but it could also mean that researchers don’t feel they need to restate their position since the consensus view is so widely held. If I stop eating chocolate ice cream, you can’t conclude that I no longer like chocolate ice cream. I might be saving room for cookies. Now Schulte did find that 6% of the papers disagreed with the consensus view, and 1% of the papers (6 papers total) explicitly disagreed. This could show an increase in climate skepticism. But Schulte’s paper also found that 7% of the papers (38) explicitly supported the consensus view. Suppose we take the data from the Schulte paper and only count the ones that explicitly take a position on climate change for or against. By Schulte’s own work, 38 were for, and 6 were against. That means 86% of climate papers with a specific opinion support the idea of human-driven climate change. It’s not the 97% often quoted, but it does seem to support some consensus. Do you think that human activity is a significant contributing factor in changing mean global temperatures? The survey also asked folks to list their area of expertise. Of those that responded, 90% answered “risen” to the first, and 82% answered “yes” to the second. So you could say that 82% agree with the idea of human-driven global warming. This is similar to the above study. Doran and Zimmerman then looked at the responses of 79 “expert” respondent. These were folks that said their research was in climate change, and at least 50% of their research publications were on climate topics. They found that 97% of the “experts” answered both “risen” and “yes.” This is the origin of that popular statistic. The NIPCC report criticizes this paper on two grounds. First, the survey was only sent to earth scientists, excluding other scientists such as solar physicists, geologists, or astrophysicists (like me). In this way the survey was already biased in favor of climate change. The second is that by focusing on the “expert” surveys, Doran and Zimmerman further biased their results. These are both valid criticisms. A survey of earth scientists is not a survey of all scientists, so the work doesn’t prove the claim that “97% of scientists” support global warming. But the second criticism is interesting, because it questions whether “experts” can also be fair. Should we listen more strongly to those who actually research climate change, or should we be wary of their ulterior motives? Excerpt from page 17 of the NIPCC report. Which brings me to one more paper. A 2013 paper by John Cook and others. This work looked at about 12,000 refereed scientific papers specifically focused on “global climate change” or “global warming.” They found that most of the papers didn’t express an opinion on the consensus view one way or another, but of those that did, 97% supported the consensus view. That’s even higher than what the Schulte paper showed. But Cook and friends went one step further. They asked the authors of these papers if they thought their research supported global warming. About a third said their paper was neutral on the topic, but of the other two thirds 97% said their paper supported global warming. So the scientists usually supported climate change, even if they didn’t explicitly say so in their paper. None of these works support the claim that 97% of all scientists support global warming. It’s pretty clear that the 97% claim doesn’t hold up. But what does hold up is the idea that most climate scientists who actually do research on global warming seem to believe in the IPCC position that global warming is real and caused largely by humans. Even the NIPCC seems to agree with the idea that among climate scientists who actually publish climate research, most support the consensus view. They instead argue that the percentage of support is not 97%, and that excluding the views of other scientists us unfair. What that all means is the topic of our next post. Cook makes no effort to disguise his bias: his blog, misleadingly called “Skeptical Science,” is mostly a collection of talking points for environmental activists and attacks on realists. 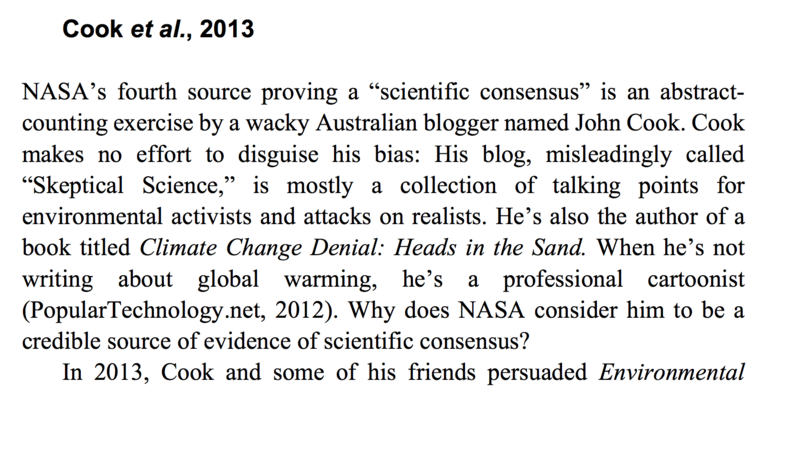 He’s also the author of a book titled Climate Change Denial: Heads in the Sand. When he’s not writing about global warming, he’s a professional cartoonist. Dr. John Cook is a Research Assistant Professor at George Mason University. He is the author of thirty research papers, and is the coauthor of two books on climate science. He also writes “Skeptical Science,” a blog on climate skepticism. The other authors of the paper aren’t mentioned in the report, but they include a Professor of Chemistry, a postdoctoral scholar at NASA’s Jet Propulsion Laboratory, and a doctoral student in environmental science. Remember the issue of framing? Regardless of whether you think global warming is real, I want you to ask yourself whether the first introduction is fair and honest, or whether it is encouraging you discount his work without actually looking at it. If I had introduced the NIPCC study as written by “a whack-job who once thought aliens built a moon,” would that be fair and honest? With that in mind, here’s your homework. I want you to read through chapter 1 of the report, specifically looking at the way various researchers are presented. When a work supports acceptance of climate change are the credentials of the authors minimized? Are their results portrayed as tentative and unclear? When a work “debunks” the consensus view are authors presented as qualified and their research sound? Next Time: Bias, Groupthink and Lies. Are climate scientists being honest, or do they have a hidden agenda. I find these attempts to “measure” consensus pointless, and any attempts to “refute” them equally pointless. Science does not advance by consensus. Jpatrick, I beg to differ with you! The history of science in its various fields contains stories of up-and-coming new scientists being confronted and blocked by the current “leader” and expert scientist of the day. Science does indeed advance by consensus. Thi is especially true when the “new” idea is counter to current notions and theories, or seems counterintuitive to the current thinking. New ideas must be “proven” and confirmed by repeating the measurements by others in order to become accepted. Remember “cold fusion?” Coming closer to home, what about the false paper written by a doctor proving that vaccines caused autism. Other doctors could not repeat his data and he finally admitted the fraud. Too many parents have refused to get their children inoculated and measles is coming back. Over 1500 children have died. Should the doctor be charged with mass murder? When Einstein released both his theories on special relativity and general relativity, these theories were not accepted by the current of the day scientific community as proven theories. It wasn’t until some of the predicted effects within his theories were noticed, checked, and rechecked that the theories were on the path of acceptance.